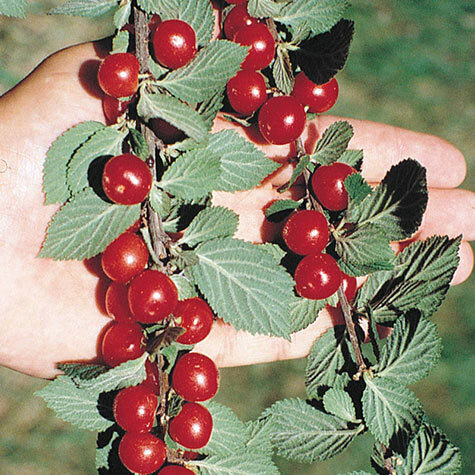 Nanking Bush Cherry | Gurney's Seed & Nursery Co. Early and extra productive! 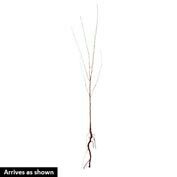 Produces sweetly scented spring flowers and tremendous crops of tasty fruit. Bears up to 8 qts. of bright red cherries; ripens in July. Grows 6-8 ft. high; looks good in a hurry. For best yield, plant two or more. Zones 2-8. Yield: Up to 8 quarts at maturity. 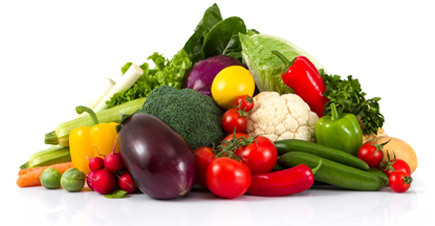 Fruit: 1/2 inch, short-stemmed, red fruit. Comments: Thrives almost anywhere. Usually bears the first year if planted early enough. Tart, tangy flavor like that of sour cherries. Holds well on the plant 2 to 3 weeks after ripening. Attracts birds and other wildlife. Heavy crops. 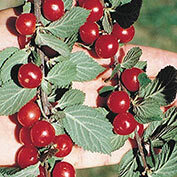 Sour and bush cherries will tolerate heavier soils. Cherries do not like wet feet. Do not soak trees for over 24 hours prior to planting. If fertilizing, only use a slow release fertilizer.